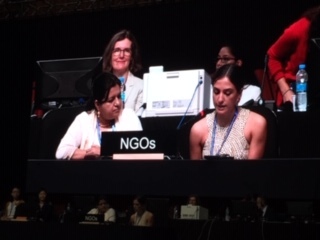 The ICH NGO Forum would like to start by thanking the host Country of Mauritius and the UNESCO Secretariat of the 2003 Convention for their kind hospitality and facilitation of the meetings and the work on the occasion of the 13COM sessions. We are happy to see the Director General of UNESCO is with us today. We have the newly launched ICHNGO.net for facilitating sharing of ICH practices, events, and for inventorying complementing the Forum website. We are introducing an ethics program responding to the ethical principles of the Convention. The Forum is also taking initiatives for consultation on the roles of NGOs inter alia for the implementation of the 2003 Convention. The 2018 ICH NGO Forum Symposium held here yesterday focused on “The Roles of NGOs in implementing the 2003 Convention’. – to strengthen capacities of accredited NGOs in relation to the possible roles, e.g. via online survey or database. NGOs can play a crucial role for taking up roles of mediation, facilitation and cultural brokerage with respect to cultivating local to global safeguarding processes in ICH. This mediation role of NGOs for ICH was highlighted already as well in the debates of the Committee and the General Assembly and ‘brokerage’ is mentioned in the new 2016 OD chapter on sustainable development. Following this, the Forum would like to express its deep satisfaction with the transparency and dialogical nature in which the reflection on the ways in which the participation of NGOs could be further enhanced, and how this reflection process will contribute to the development of the current accreditation system. During this 13.COM however, the ICH NGO Forum will have its first fully elected Steering Committee with each of the 6 regions represented, along with a seat reserved for international NGOs to maximise the exchange of experiences, and to develop our governance structure and guarantee good participation. This Steering Committee, along with the general Forum, will play an integral role in the training of regional NGOs on regional network building and reporting as well as on outreach programmes. Mr. Chairperson and Committee members, the ICH NGO Forum consistently calls on, and makes great efforts to better communication and connect with State Parties. We reiterate this call and request to member states and Category II Centres to support the efforts of the ICH NGO Forum to deepen our communication and strengthen collaboration to further develop our regional networks and develop the capacities of NGOs working under the 2003 Convention.